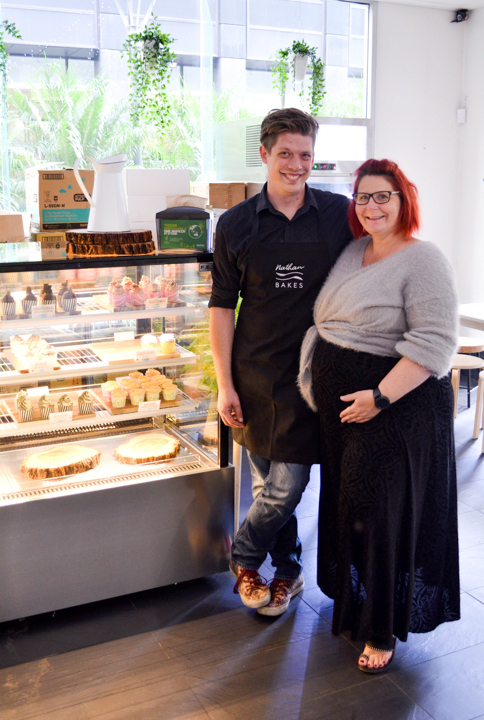 Due to popular demand, Hilary Schubert-Jones and her husband, Nathan, have set up a permanent location in the CBD to satiate the city’s demand for gluten- and dairy-free desserts that don’t compromise on quality. Hilary Schubert-Jones and her husband, Nathan, are happy to discuss this motto with people, too. “You can find vegan desserts and you can find gluten-free desserts, but for us to be able to find vegan and gluten free – especially good baked goods – it’s a challenge,” says Hilary. Nathan Bakes was founded as a response to this challenge. Nathan Bakes got its start selling dairy- and gluten-free offerings temporarily at the Central Markets. But due to the limitations surrounding stall estate and the demand from customers (“we were baking cupcakes and as soon as we put them out people were buying them,” says Hilary) the couple decided to sign a 15-year lease for a brick-and-mortar space just off Grenfell Street. For those ambivalent about what cupcake to pair it with, a wheel can make that decision for you. The wheel has 12 numbers and each number corresponds to a cupcake. Spin the wheel and the cake gods will decide your fate. May the cupcake gods be kind. What makes Nathan Bakes truly different from its contemporaries, Hilary explains, is its desire not to settle. “For far too long people have had to kind of just put up with bad food,” she says. L-R: Nathan Bakes co-founders (and husband and wife) Nathan and Hilary Schubert-Jones. With Nathan having been a pastry chef for 11 years, the Schubert-Joneses believe his classical training, adapted to fit the modern considerations of inclusivity around dietary requirements, results in a higher quality product. However, the duo doesn’t plan on only sticking to cupcakes. They want to add tarts, biscuits and some savoury options – like muffins and quiches – to their roster, too, as well as more seating options. The ultimate aim, though, is just to create desserts that make people happy.